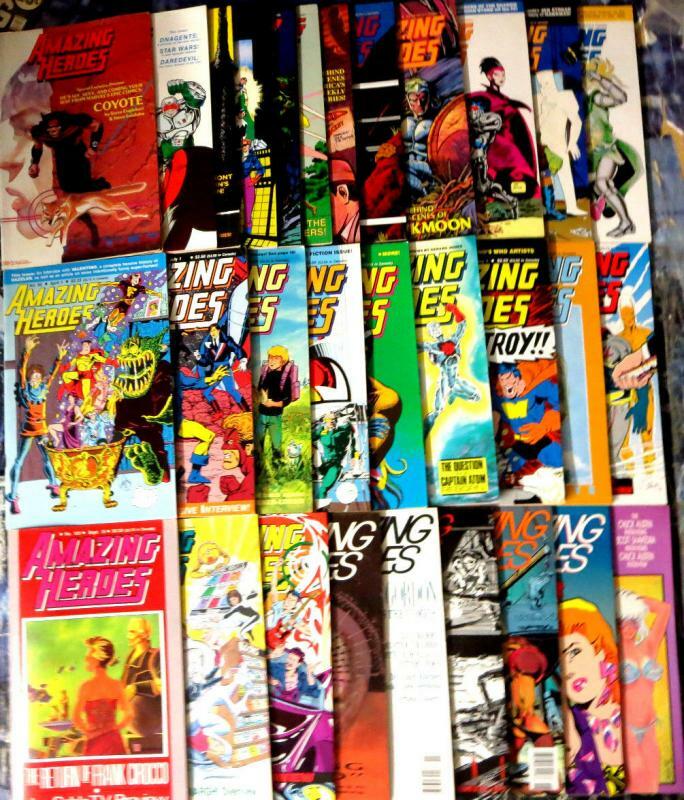 LOT OF 30 _AMAZING HEROES_ Magazine Backissues (March 1983 - June 1988) See Our E Bay Store for Single Issue Listings _, __AMAZING HEROES_ was a magazine about the comic book medium published by Fantagraphics Books from 1981 to 1992.__The regular content included industry news, comics creator interviews, histories of comic book characters and reviews. 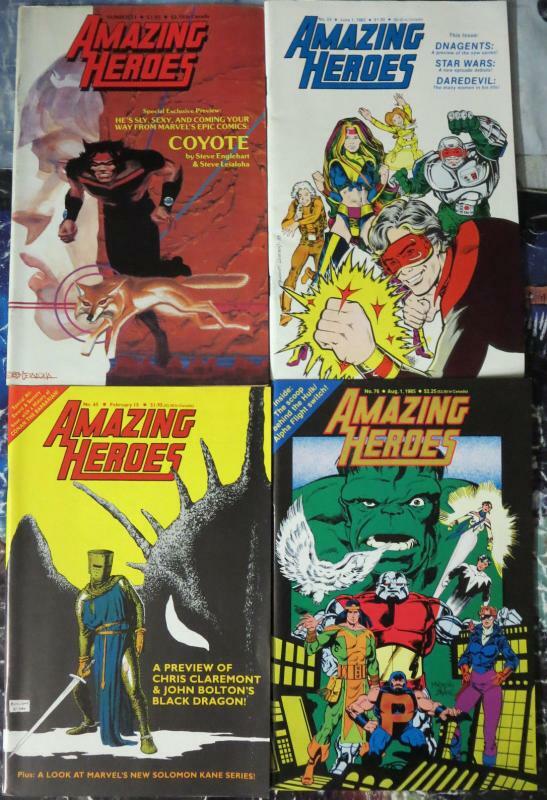 Features included _Hero Histories_ of various characters/features, previews of upcoming series, and letters page. Other regular features were a column called "Doc's Bookshelf" by Dwight Decker (which ran from 1987–1989), and a question-and-answer feature called "Information Center," which ran from 1986–1989. 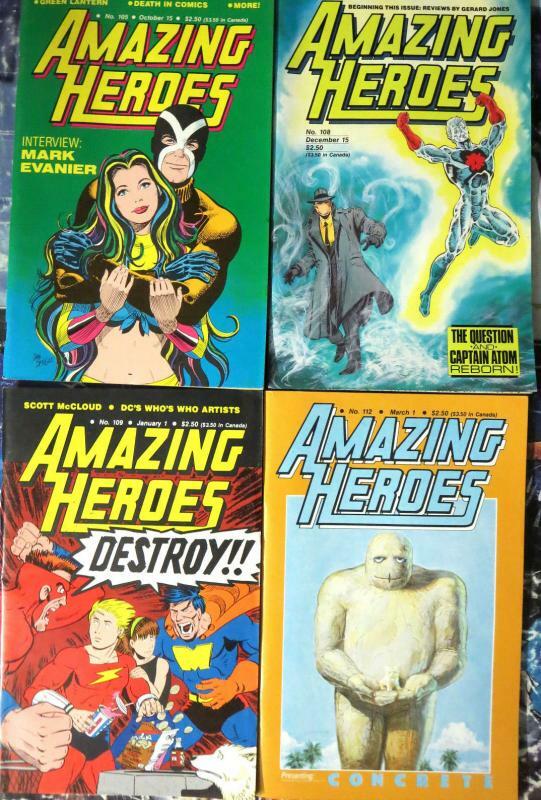 A companion magazine to the classic COMICS JOURNAL, this lot is a YOU ARE THERE history of comics in the 1980s. For this listing you'll get the following issues (descriptions included) : #21, 24, 65, 76-78, 80-81, 86-87, 89-90, 92, 98, 103-105, 108-109, 112, 124-125, 127-128, 130, 137, 139-141, 143 #21 (MARCH 1983) Steve Englehart and Steve Leialoha are interviewed about Coyote; New Gods history - Part 2; 'Silly Cover' satirizing Conan is drawn by Bruce Timm. Leialoha cover painting. Star Wars Al Williamson newspaper strip reprints #24 (JUNE 1983) DNAgents preview; a look at the many women in Daredevil's life. DNAgents cover by Will Meugniot. Star Wars: The Return of Ben Kenobi newspaper strip reprints #65 (FEBRUARY 15, 1985) Preview of Black Dragon; a look at Solomon Kane; Conan history. Black Dragon cover by John Bolton. Star Wars "Showdown on Kumal" newspaper reprint continues. #76 (AUGUST 1, 1985) August 1, 1985. Inside: The scoop behind the Hulk/Alpha Flight creative Team Switch. 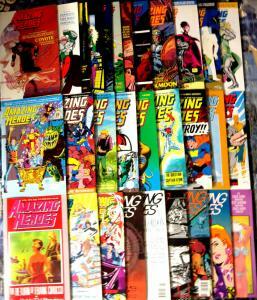 Plus: Eclipso history; Lois Lane - First Lady of the Comics. Hulk/Alpha Flight cover by Mike Mignola and John Byrne. #77 (AUGUST 15, 1985) Spooky issue featuring Mr. Monster and Deadman. 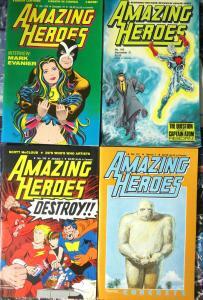 Mr. Monster preview; Jack Kirby Awards results. Mr. Monster/Swamp Thing cover by Michael T. Gilbert, Loebs, Stephen Bissette and John Totleben. #78 (SEPTEMBER 1, 1985) Article on The Outsiders featuring an interview with Mike W. Barr; Hero History of the Justice League (Part 1). Jim Aparo cover. #80 (OCTOBER 1, 1985) Blood of the Innocent (featuring Dracula and Jack the Ripper) - Behind the scenes of America's first weekly comic book series. 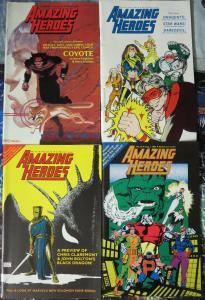 Plus: Progressive super-heroing in John Byrne's Fantastic Four; Omega the Unknown history. 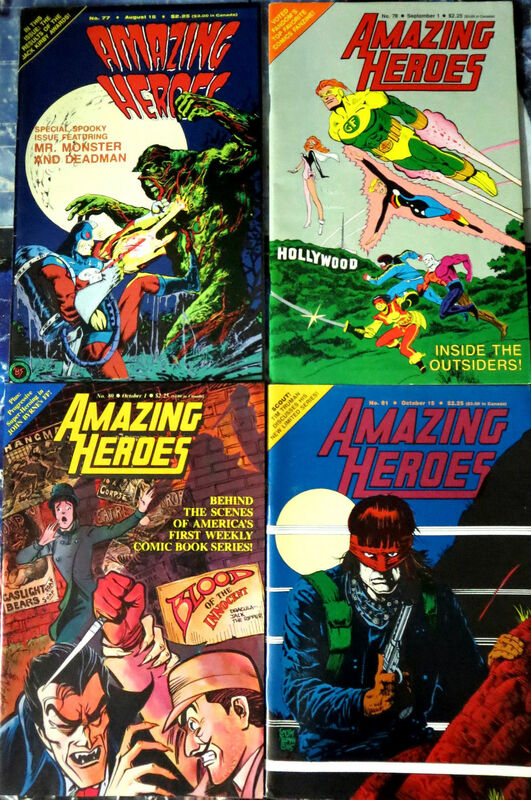 #81 (OCTOBER 15, 1985) Interview with Tim Truman on Scout; a look at Atlas Comics. Truman cover. 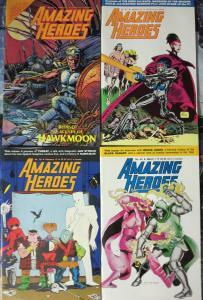 #86 (JANUARY 1, 1986) Hawkmoon preview; histories of Quicksilver and Scarlet Witch. 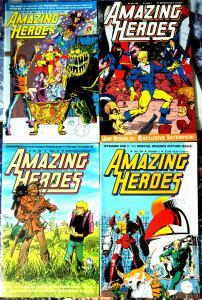 #87 (JANUARY 15, 1986) Previews of Electric Warrior, Lords of the Ultra Realm & Hero Alliance. Cover by Jim Baikie. #89 (FEBRUARY 15, 1986) Threat preview; Jan Strnad interview on Upshot Graphics line; Hawkman history; 'Silly Cover' satirizing Rocketeer is drawn by Bruce Timm #90 (MARCH 1, 1986) Bruce Jones interview; Heroine History of Black Canary; a look at comics censorship in the 1950s; The Comet Man preview. Dennis Fujitake cover. #92 (APRIL 1, 1986) Interview with Jim Valentino on Myth Adventures; a look back at the entire normalman series; Heroine History of Dazzler. Valentino cover. #98 (JULY 1, 1986) Interview with Jim Starlin; looks at Eternity Smith, ESPers. Starlin cover. #103 (SEPTEMBER 15, 1986) From Journey to Jonny Quest and back again - an extensive interview with William Messner-Loebs. Plus: a history of the Creeper; Micra preview; Bob Burden narrowly escapes flaming death in Chicago. 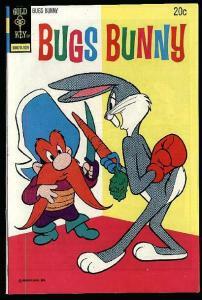 Cover by William Messner-Loebs. #104 (OCTOBER 1, 1986) Science fiction issue. Dynamo Joe preview; a look at the 10 best science fiction comics. Dynamo Joe cover by Doug Rice. 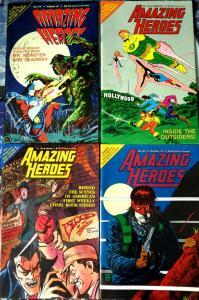 #105 (OCTOBER 15, 1986) Interview with Mark Evanier; a look at death in comics. Crossfire/Rainbow cover by Dan Spiegle #108 (DECEMBER 15, 1986) Article on The Question featuring interviews with editor Mike Gold, writer Denny O'Neil and penciller Denys Cowan; article on Captain Atom featuring an interview with writer Cary Bates; interview with Karl Kesel on his inking work; Gerard Jones reviews Superman #1, Adventures Of Superman #424 and Action Comics #584. Cover features the Question and Captain Atom by Cowan, Rick Magyar, Pat Broderick, Bob Smith, Ed Hannigan and Tom Ziuko. #109 (JANUARY 1, 1987) Interview with Scott McCloud on Zot! and Destroy! ; 'Who's Who in Who's Who' - article & artist checklist. McCloud cover. #112 (MARCH 1, 1987) Article on Concrete and Paul Chadwick, and Concrete preview; Hero History of the Spectre; a look at Arrow Comics. 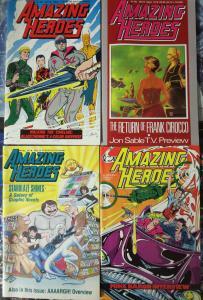 #124 (SEPTEMBER 1, 1987) Interview with Frank Cirocco; Jon Sable TV preview; Marshal Law preview. Cirocco cover. 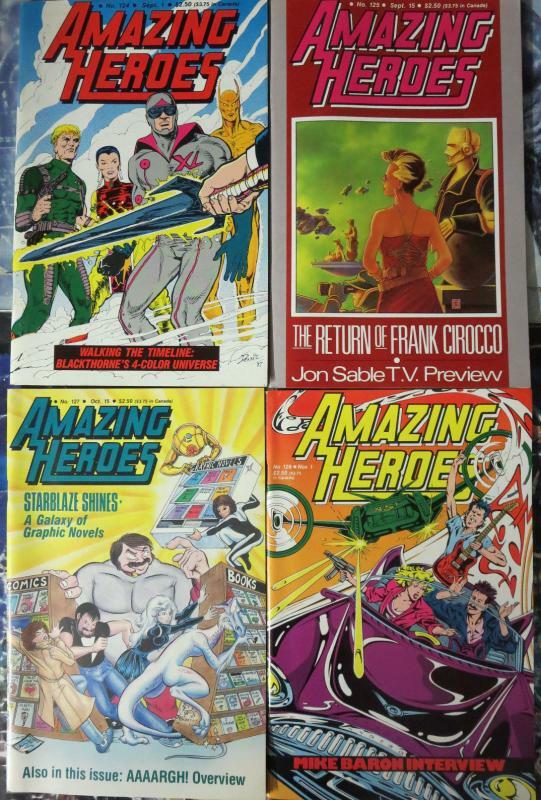 #125 (SEPTEMBER 15, 1987) The Return of Frank Cirocco - an interview. Plus: a preview of Marshal Law; Jon Sable TV preview. Cover painting by Frank Cirocco. 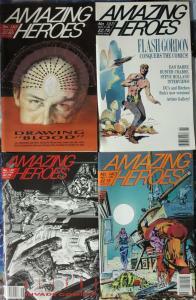 #127 (OCTOBER 15, 1987) Starblaze Shines - A Galaxy of Graphic Novels. Plus: AAAARGH! overview. #128 (NOVEMBER 1, 1987) Mike Baron speaks in a feature-length interview. Plus: Harrier, Mike Thibodeaux, and the first Sidney Mellon column #130 (DECEMBER 1, 1987) J.M. DeMatteis and Kent Williams discuss Blood; a look at the Shadow Line Saga. Kent Williams cover. #137 (MARCH 15, 1988) Flash Gordon is spotlighted; interviews with Dan Barry, Buster Crabbe, Steve Holland. Cover by Sandy Plunkett. #139 (APRIL 15, 1988) Mark Verheiden and Mike Richardson discuss Aliens; Mike Richardson discusses Godzilla. Aliens cover by Mark Nelson. 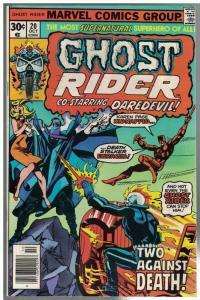 #140 (MAY 1, 1988) Marvel Comics Presents previewed. Plus: The Light and Darkness War. Cover features Wolverine, Shang-Chi and Man-Thing by Tom Grindberg. #141 (MAY 15, 1988) Women in comics are profiled - interviews with Ramona Fradon, Cara Sherman-Tereno, Carrie Spiegle, Dann Thomas, Sharon Wright, Mary Wilshire. Cover by Colleen Doran. 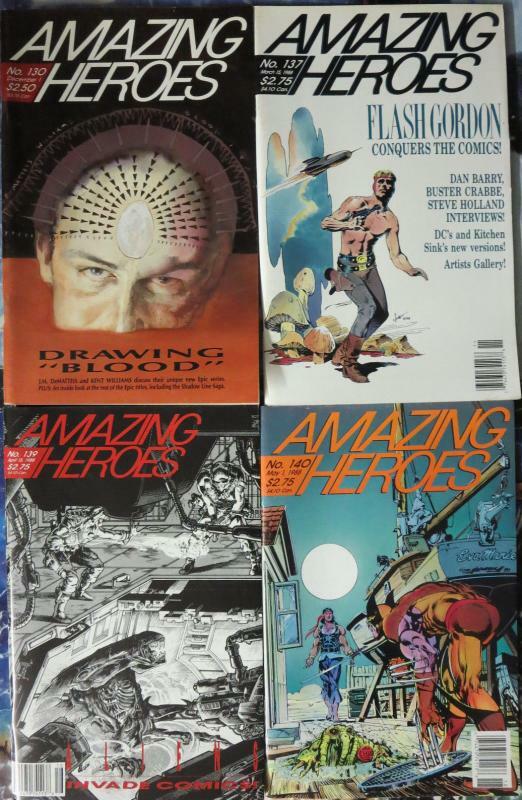 #143 (JUNE 15, 1988) Chuck Austen interview; article on gays in comics (part 1), featuring interviews with John Ostrander, Tim Truman, Mike Grell, Doug Moench, Marv Wolfman, Howard Cruse, Cat Yronwode, Don McGregor, Bill Mantlo, Tom DeFalco, Chris Claremont, Mark Evanier, Max Allan Collins, Mike Baron, Chuck Dixon. all books are or better. 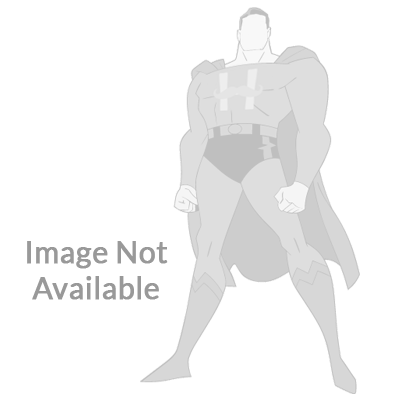 End Of Description Read this legend for an understanding for how our grading system works: M = Mint a perfect, unread comic. White pages, sharp corners, perfectly aligned cover, tight staples, sharp square corners, no creases, marks, fading of any kind - no flaw whatsoever. We have never actually graded a book as Mint. to Quote Phil Seuling: "Mint is a flavor of chewing gum." 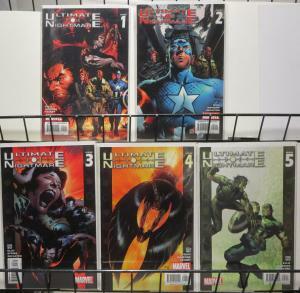 Nm = Near Mint This is what most comics look like when purchased new, presuming no harassment on the racks. Tight staples, glossy cover, sharp corners, no marks, white pages. Any flaws are HINTS of a flaw. Maybe look very closely and you the perfectionist will see a miniscule mis-alignment of the cover with the pages, or the hint of the rounding of a corner. Run your fingers down the spine and you may feel a crease which isn't visible to the eye. 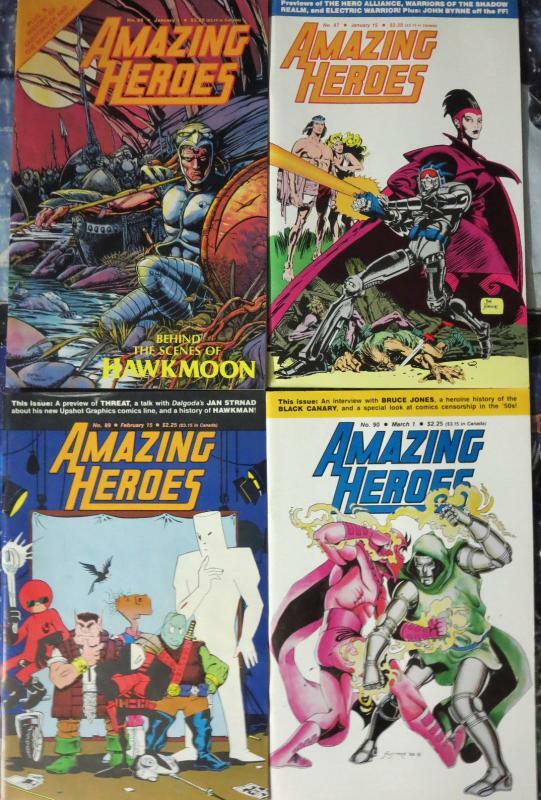 Those are the kind of things which mean that nearly all "as new" comics are graded as Near Mint rather than Mint. You will notice that in our 1000s of listings, we don't use this grade either.